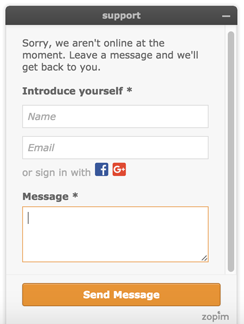 When your widget is offline, visitors can leave a message with their contact information in the offline form. By default, this form is enabled with the message shown "Sorry, we aren't online at the moment. Leave a message and we'll get back to you." For Team, Professional, and Enterprise plans, you can edit the message that appears or disable the form completely. The following instructions apply to you if you are using Legacy Zendesk Chat without Support. In your Chat dashboard, go to Settings > Widget and click the Forms tab. In the Offline Form section, edit the text in the Offline Greeting field, then click Save Changes. In the Offline Form section, click Off, then click Save Changes. Note: The offline form is disabled automatically if you are using the contact form in the Web Widget. If you’re using Legacy Zendesk Chat with a linked Zendesk Support account, you need to use the contact form component of the Web Widget. For details, see Using Web Widget to embed customer service in your website. To add your Facebook account, you will need to specify your Facebook username or page ID. We recommend using the page ID because it is constant whereas you can change your username. Open your Facebook page and click on the About tab. Scroll to the bottom of the More Info section and you will see the specific Page ID. Copy and paste that number into the offline form settings page. Note: If you are using the Zendesk Message product and have already connected a Facebook account, double clicking on the field will reveal a drop-down that allows you to select which page/account should be visible on the offline form. To add your Twitter account, you will need to specify your Twitter User ID. Go to Your Twitter Data page. Under the Username field, copy and paste the User ID number into the offline form settings page. When turning on Twitter Direct Messages on the widget, you will want to ensure that you have turned on "Receive Direct Messages from anyone"in your Twitter account.